Yes there are green tomatoes and red tomatoes in this week’s share. You know what that means, right? Yes it means the tomatoes in the field are not ripening up anymore so I picked all the green ones that were left. Sorry there are so many small-ish ones, but that’s mostly what was left on the plants. Green tomatoes you can batter and fry, or make chutney/jam/relish, or…??? There are still some actually ripe tomatoes coming out of the hoophouse, but limited quantities – that’s why you only have a few in the share. Another newbie this week is escarole! This salad green is related to chicory and radicchio. I recommend soaking it in cold, cold water for 20 minutes before serving to take some of the bitter out of it. It’s real nice with olive oil and lemon juice, or a simple vinaigrette. Check out the recipe below for escarole, beet, goat cheese, & walnut salad. 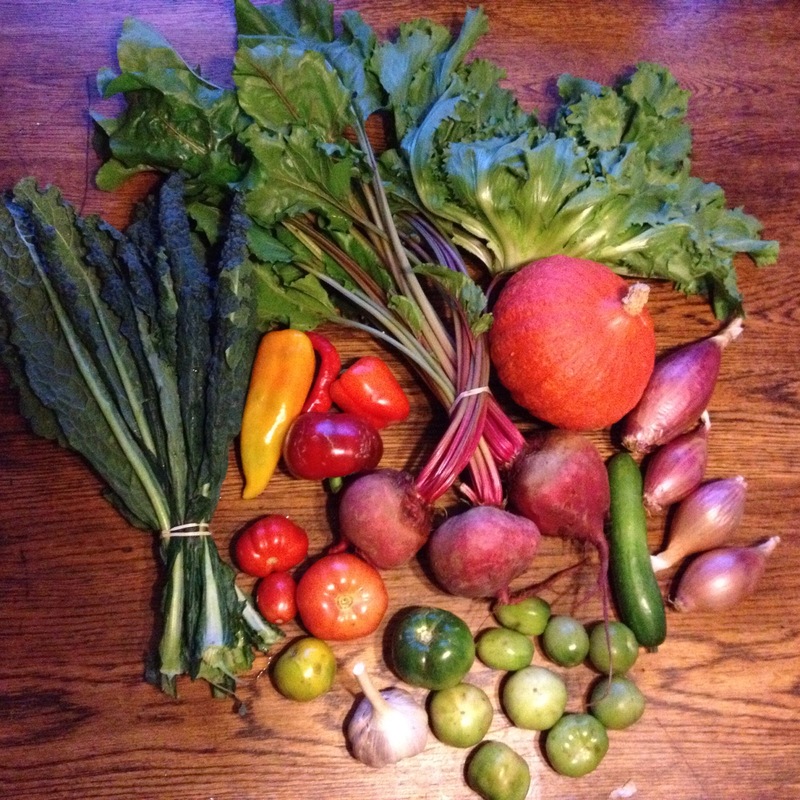 Yes there are beets in the share this week – my oh my are there ever! This planting of beets got huge-normous. Hopefully you eat them before they eat you. Remove the greens from the roots and store them separately for best longevity in the fridge. On the winter squash arena we have a nice French pear-shaped bright orange beauty called “Potimarron.” It’s name means “chestnut pumpkin” as it has a chestnutty flavor. (By the way this squash is either the same or very similar to “red kuri” if you’re searching for recipes). I’d recommend roasting it in wedges in the oven for a simple side dish or main. One thing that’s nice about this variety is that you can eat the skin of it as well as the flesh. Oh and if you don’t want to eat any of the winter squash in the week you receive it, don’t worry – they store for quite a while. Just leave it on your counter or in a cool/dry-ish place in your house. They should store for weeks if not months and months. Lacinato kale makes its long-awaited return this week. The fall planting of it looks SO much better than the early planting. Some of these leaves are BIG! There were some aphids but I did my best to spray them all off. Rounding out the share are a few sweet peppers again, a head of the hardneck italian easy peel garlic, and the long red torpedo onions. Whew! That’s a bunch of stuff to enjoy!!!! 1. Preheat the oven to 400F. Cut off and discard any beet stalks. Scrub and dry the beets. Put them on a baking sheet and roast until a sharp knife easily pierces them, 40-60 minutes. Set them aside to cool. 2. Meanwhile, mince the shallot and put it in a bowl with a sprinkling of salt and pepper, the vinegar and the orange juice. Set aside and let the vinegar mellow the shallot’s flavor while the beets roast. Just before dressing the salad, whisk in the olive oil until the dressing emulsifies. 3. Roughy chop the walnuts and put them in a dry skillet over medium heat. Heat them, tossing often, until they darken and smell toasted, 4-6 minutes. Prep the escarole. 4. When the beets are cool enough to handle, peel them by rubbing their skins with a paper towel. (The skin should come off easily and the paper towel will help keep your hands from staining.) Cut the beets into 1/4-inch slices. 5. Put the beets, escarole and walnuts into a salad bowl and toss with a little of the vinaigrette at a time until the escarole tastes good. Crumble in the goat cheese and toss. Add more salt and pepper to taste. Place the cornmeal in a shallow bowl. Place the eggs in a small bowl and beat them with salt and pepper to taste. Rinse, core, and, using a serrated knife, cut the tomatoes into ¼-inch slices. Dredge the tomato slices on both sides in the cornmeal. Using a fork, dunk the tomato slices in the egg mixture, then dredge them again in the cornmeal on both sides. Set the tomato slices aside on a cutting board or platter. Preheat the oven to 200°F. Line a baking sheet with paper towels. Place the oil in a 12-inch cast-iron frying pan over medium-high heat and heat until the oil registers 365°F on a candy thermometer. Slide 3 or 4 tomato slices into the hot oil and cook them for 2 to 3 minutes, then turn them and cook until golden brown, about 2 minutes longer. Transfer the fried tomato slices to the paper towel–lined baking sheet and place the baking sheet in the oven to keep the tomatoes warm. Repeat with the remaining tomato slices. Serve warm in a towel–lined basket. 1. Scrub the squash well to remove any dirt. Slice the squash in half and scoop out the seeds. Cut the halves into 1-inch slices, and then cut the slices into chunks that are roughly 2 inches in size. 2. Heat a skillet over medium-high heat. Add the oil, followed by the squash, and cook for a few minutes, stirring occasionally. Stir in the garlic, then add ¼ inch of water to the skillet and bring it to a boil. 3. Cover and reduce the heat to a simmer. Cook until the squash is fork tender, about 10 minutes. Taste and season with salt.